This is a guest post from Dr Annie McAuley, the founder & CEO of TalkiPlay. Annie’s a mother, biomedical researcher & tech entrepreneur. Through sheer necessity, she created the innovative TalkiPlay to engage her youngest child in early speech development through interactive play. Read what Annie has to say about “having it all”. This morning I dropped my daughter off at kinder where it’s writing week and today is ‘express yourself day’ – be the leading character inside you! Now like most kids her age she straight-lined for her Elsa costume (from the Disney movie Frozen). And as she belted out “Let It Go” at the top of her voice, I was left thinking…. I want my daughter to “have it all”. To rule her castle. To have the career of her dreams – to be a Doctor. To have those six babies (I’m hoping she will rethink that number with time). Believing you can be and do anything you want in life is the ideal mindset I want for all kids growing up. 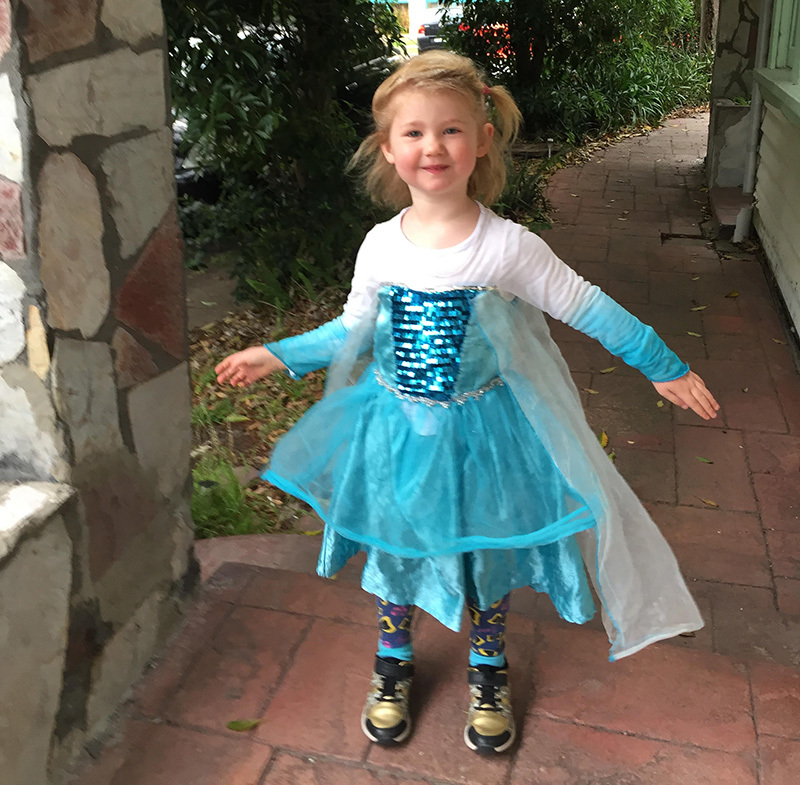 Annie’s daughter Grace in her Elsa costume – being the boss of the land! This is the current dilemma many women (and especially mothers) are facing right now in this world, no matter what their stage in life. Whether they’re pursuing further education, are pregnant, or are at home with their child (or children), working, starting a business, going for that promotion. At moments this year, building TalkiPlay, I did wonder if the world would crash around me. Particularly leading up to Demo Day, and how I was going to balance family and travelling to the USA. I was so stressed I couldn’t sleep. I worked around the clock to build the product to live demo and have ready for preschools to trial. But most of all, I was worried that in doing this I would let my family down, that I would break my promise to my kids – of seeing The Wiggles in concert. But I didn’t crash, I thrived! And it felt great to know it was worth investing the time in myself to grow in business. (P.S The Wiggles rock, I reached out to them and they get parents big time, they found us another show to attend – plus we got to meet the Wiggles in person!). And what I learned was reaching out and asking for help, and building that strong network around me was vital for me and my family. While try to multitask standing on the train on the way to work, checking my emails and the calendar of who is on school pick-up today, I realise: Am I possibly phrasing the question all wrong! Am I linking the process – that to “have it all” means that I have to do it all? In a business that approach is nonsensical. To thrive, I didn’t do it all. I couldn’t. There’s already so much self-pressure to be a great mother, partner, friend, and to do well at work. So when I was working so hard to launch my startup, I simply had to get support. I sought advice in business decision, in literacy, in tech, in STEMs. And in family, I had the support of my husband (who did more than his 50% share), the support of my extended family, of grandparents and aunties and uncles, a community of parents around me, my friends, colleagues at work – and the amazing women at SheStarts to share the highs and lows of the journey (and wine). I am part of a huge support system filled with people that make the day-to-day life of family and building a successful global business possible. I now know I was thinking. I was thinking that if I believe in myself, and if those around me believe and support me, then I can do this. And I need to do this, as it’s the right thing to do to bring TalkiPlay to the world. Because every child needs the best possible access to education. And every child should have the opportunity to find their voice – so they can be the protagonist of their own life. I leave you with this: “Let it go!” Don’t ‘hold it back anymore’. Be the woman you always wanted to be, as we as a community will support you to thrive. Do you feel like you “have it all”? Do you think it’s a myth that’s really impossible to achieve? How do you maintain balance in your life?